Weeki Wachee mermaids come to London! 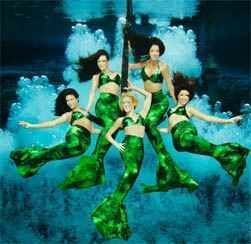 Here’s a bit of excitement for birthday weekend… The Weeki Wachee mermaids are in town! I’m sure you erudite folk are aware of these legendary beasts but if not, you can learn more here. They’ll be at the London Aquarium down on the South Bank tomorrow, splashing around in a tank with turtles and all sorts. Sounds amazing and I can’t believe it’s their first ever international performance!